When over 50 pension funds and institutional investors managing $8 trillion dollars on behalf of millions of households voiced their universal support for the pilot earlier this year, the New York Stock Exchange saw the writing on the wall. Their ability to pay rebates was in jeopardy, and they needed to act. NYSE’s business model relies on paying rebates: NYSE buys market share with rebates, which helps to entice order flow to an exchange with poor execution quality. In turn, market share is used to justify charging monopolistic prices for market data and connectivity. Instead of questioning the merits of the pilot — which would be difficult since the SEC pilot is well designed, informed by industry input, and universally supported by investors — NYSE decided to mislead their listed companies. In a blog post, they published a disingenuous analysis claiming the pilot would cause one billion dollars in harm to investors, ignoring the fact that every investor who has spoken out is overwhelmingly in support of the pilot. 2. However, if we then update NYSE’s model for the 50% remove and 20% add rates, the cost drops to $216 million — a far cry from both the $720 million and the total $1 billion estimate. NYSE assumed — without support — that investors never add liquidity, so we did some fact checking. Across the agency and “bulge bracket” broker dealers we polled, adding rates across all types of institutional order flows ranged between 25% and 60%, with the mode at 40%. A 40% add rate for investors, using NYSE’s flawed model, would produce a $144 million cost to investors, an 85% reduction from their original $1 billion estimate. In other words, lowering the rebate reduced hyper-competition to be first in line to provide liquidity, creating opportunities for investors to add liquidity more often and decreasing their need to cross the spread. So the 40% assumption for “adding rate” during the pilot might even be low. This phenomenon helps expose a key blind spot in NYSE’s analysis: investors ultimately drive real price discovery and will provide liquidity when not crowded out of a latency and rebate obsessed market structure. Both institutional and retail investors submit limit orders independent of a rebate consideration because rebates generally do not accrue back to their beneficial owner. Therefore, if rebates decrease it will not change the prices at which investors are willing to display orders. Of course, Nasdaq’s experiment and its outcomes aren’t a perfect proxy for what is likely to happen in the Transaction Fee Pilot. That experiment was done unilaterally and only in highly-liquid securities. It reduced their quoted size at the inside, and Nasdaq lost 1.8 percentage points of market share. Ultimately, we won’t resolve the debate around rebates and access fees with conjecture. This is the reason the pilot is so important — it will provide the ability to gather real data on a critical and long-debated market structure issue, and its impact on market quality and the cost to trade. Crack #2: Rebates uniformly narrow spreads. NYSE states that since the pilot would reduce access fees for certain securities, rebates would decline commensurately. The flawed assumption is that spreads would then uniformly widen by the same 8.2 mil amount as the rebate reduction. As any market practitioner knows, spreads are narrow or wide for a variety of reasons: investor supply and demand at various price levels, market maker competition and risk tolerance, share price, volatility, average daily volume, and many other factors. In other words, the assumption that only rebates keep spreads narrow is weak. Many quotes at the NBBO (National Best Bid and Offer) are from exchanges that do not pay rebates to liquidity providers. For the 1,000 most active stocks, which represent nearly 80% of all market volume, at least one of the non-rebate paying exchanges (Nasdaq BX, Bats-Y, EDGA, and IEX) is actually on both sides of the NBBO about 50% of the time and on one side of the NBBO about 90% of the time. This suggests that NYSE’s spread prediction is off by at least 50% for the most actively-traded securities. Once again, Nasdaq’s real-world experiment reveals the weakness of NYSE’s 8.2 mil assumption. When Nasdaq reduced rebates to 4 mils as part of its study, its time quoted on both sides at the NBBO (“the inside”), declined from 93% to 88%. If we assume that when Nasdaq wasn’t at the inside, their spreads increased from 1 cent to 2 cents, this would mean that their average spread increased ~5 mils a share, from 107 mils to 112 mils. In contrast, NYSE’s model would have you assume that spreads would have widened by 26 mils, a 5-fold overestimate. The below sensitivity analysis demonstrates how quickly the costs shrink when re-calibrating the spread-crossing percentage and the amount by which spreads might widen. Crack #3: Eliminating rebates creates zero benefits. NYSE focuses solely on potential harm and ignores the full range of benefits that investors could realize if rebates were banned entirely. Throughout the comment letter process, Blackrock and other large institutional investors have detailed the various problems caused by rebates: they introduce potential conflicts of interest in order routing, they exacerbate market complexity through unnecessary intermediation, and they increase adverse selection costs. Investors are indirect market participants, and their agents are generally not competing in the latency race to zero. They are not the fastest to the front of the line nor the quickest to get out of the way. In short, investors are not monetizing market complexity; they are taxed by it. This pilot is designed to test removal of what we believe is the single largest source of complexity in U.S. equity market structure. It may not be the last step but it should be the first in trying to build fairer markets for all participants. 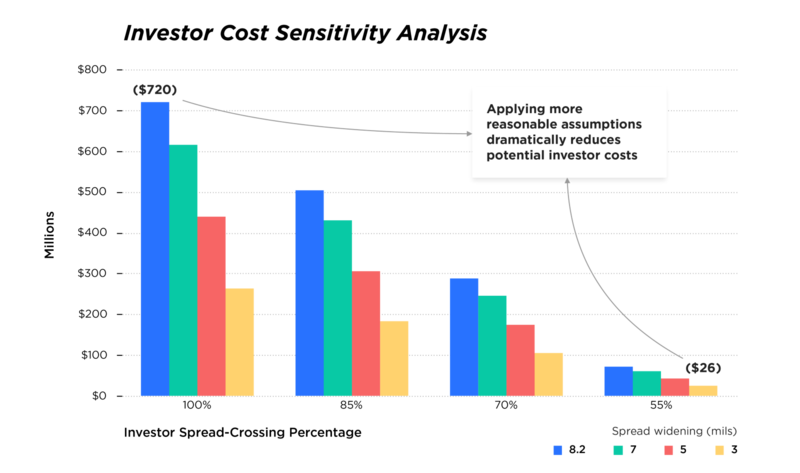 If a reduction in complexity results in even a fraction of a basis point of implementation cost savings, investors will come out of the pilot better off than they went in, which is why they have universally supported it. A Pillar of Capitalism or A House of Cards? NYSE’s analysis was the basis for an inflammatory comment letter, aggressive issuer outreach, and headline-grabbing television appearances — all tactics to distract regulators and the industry from the real issues. Investors and brokers told us they were surprised by the visceral campaign from such a storied institution as the NYSE. The only plausible explanation is that NYSE believes a thorough examination of the data and facts will lead to the elimination of rebates, undermining the core of their business model. Market share in today’s equity landscape is finely carved up with little change year-over-year. Exchange families have evolved into portfolios of venues, mainly differentiated by their rebate price points. If rebates were eliminated, there will be a huge jump ball for market share among trading venues, now forced to compete on execution quality. It’s understandable that incumbent exchanges would rather not face this threat. The last time the industry was roiled in such a divisive debate was during IEX’s exchange application. At that time, exchanges and select high-speed trading firms were pitted against the investor community and IEX. This time around, NYSE has tried a different tactic, rallying issuer support with an eye-popping number that, at its heart, is a scare tactic meant to advance NYSE’s own commercial interests while defending its conflicted business practices. Our markets deserve better. Better behavior from its stewards and better execution quality from its market structure. The Transaction Fee Pilot is a critical step to getting there. It would be a shame if the Commission’s attempt to meaningfully improve our markets were derailed by incumbents trying to protect the status quo. Over $8 trillion of U.S. household wealth and savings shares this view. Now that’s an eye-popping number we can get behind! As measured by adverse selection and markouts. NYSE Excel model (https://www.nyse.com/publicdocs/nyse/Fee_Pilot_Interactive_Model.xlsx), cell D26. 5% of trading occurs in Auctions, and another 25% occurs at the midpoint. NYSE and the entire industry know that many proprietary trading firms trade through a large broker’s “pipes” under an arrangement called “sponsored access.” Such flow is marked “agency,” but exchange fees and rebates are often passed through to these customers, significantly changing how their orders should be accounted for in NYSE’s analysis. The “Principal Cost” sub-bullet in NYSE’s second blog applies the fee reduction savings only to maker-taker venues, but applies the cost from wider spreads to all volume. NYSE assumes that spreads on maker-taker venues will widen, since there will be a reduction in rebates paid. That will be offset by the lower access fees one-for-one. However, they then assume that spreads will widen on non-rebate-paying markets, despite the fact that these markets were not reliant on rebates to maintain their spreads to begin with. These wider spreads would not be offset by lower access fees (since their access fees today are mostly lower than the caps in the Transaction Fee Pilot groups). Nasdaq’s Liquidity Share, which measures quote quality using both time and size at the NBBO, declined 10%. Each symbol was extremely liquid, so we are assuming that the spread was 1 cent, the minimum tick increment.